Your name can have many connotations but more often than not we'd like to think our names are associated with something good. When I was growing up in the Bahamas, I distinctly remember a child with the name of Felony. Ponder that. Well, I don't know if a name has power but he certainly lived up to what he was called. No felony acts were committed in grade school but he was simply uncontrollable and perhaps was heading down the path to what his name described. Also, this child never looked happy; he looked like he was always looking for trouble and finding it. Becoming a parent forces you to think about the importance of a child's name. In my culture, we didn't have a naming ceremony, but the bestowing of a child's name was very important. For each child, my husband and I spent many hours discussing and debating the merits of potential names. In addition as a Black person in America, I didn't want my child counted out of opportunities before he was in the race, simply because of his name. I'd seen the studies around an ethnic name on a resume not receiving the same consideration as someone without an ethnic name, regardless of the experience. I'd also seen this phenomenon up close and did what I could to change it. I interviewed Becky, Robert, and Jane as well as Benissa, Tyrone, Jaquan and Tifarah. As a parent, I didn't want my child's name to be a stumbling block or a liability; I wanted their names to be somewhat unique, with a spiritual meaning. We regularly conveyed to our children why we gave them the names they have. Offspring #1 - Friend or lover; he who holds Christ in his heart. Offspring #2 - God is gracious; consecrated to God. Offspring #3 - God gives strength; a woman of God; victory of the people. Offspring #4 - A singer or a song; faith and joy. As I reviewed the meanings of my children's names, I think I accomplished what I set out to do and as I considered each person, the people they are correlated to the meaning of their names. But like the child named Felony, we don't all have names we like or names that uplift us. Some of our names are literally letters thrown together with no meaning yet as the bearer of the name given to us at birth, we own that name and carry it with a degree of pride. For those that don't, as soon as they can, they legally change their names. More significant than the name given at birth is when God gives us a new name. Abram became Abraham (Genesis 17:5); Sarai became Sarah (Genesis 17:15); Jacob became Israel (Genesis 32:28); Simon became Peter (John 1:42, Matthew 16:18-19). When you become a Christian - you have a new name that creates a new identity and purpose. As believers our new names in Christ define us. Saul/Paul is an exception in that he had both of these names - one Jewish and one Roman, but once he was converted he went by his Roman name of Paul (Acts 9:1-19). Jesus changed his life. As a Christian he had a new identity - he no longer persecuted the church but became an advocate for Christ and His transforming power using the name Paul. Of the twenty-seven books in the New Testament, Paul wrote at least half. That's the difference a changed life can make. I love my birth name for its uniqueness, but my favorite name, the name that anchors me and defines me, is to be called Christian. Andree, your blog hit home for me, especially about being counted out for opportunities because of your name sounding ethical. When I was in the military, and I was stationed in Hawaii, I was able to move out of the barracks and get an apartment. This was my first time moving into an apartment so at first, I was excited, but my excitement quickly turned into frustration. After a couple of weeks of trying to find a place, a civilian on my job asked me how the apartment hunting was going; I told her that every time I applied, my application would either get turned down or my phone calls would not get returned. This woman told me it was because of my name. She said LaShana is too ethical for the places you are applying for. She told me to drop the first two letters and just go by Shana, and when I did, I was getting contacted the same day that I applied. Oh, I forgot to mention, the woman who suggested I do this was white. I thought that was sad because, I never had a criminal record and I have good credit, but none of these were even viewed because my application started and stopped at my name. It is a shame that this happens, but it does. You do have a very unique name, Nylse. I wonder how it is pronounced, since I'm not familiar with it. But wow! Felony? Really? How hard that name or description would be to overcome! 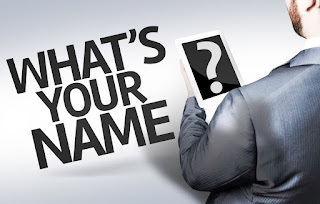 I never thought about how certain names could impact the way you are perceived or received by a potential employer. But it sounds as if you've done your homework on that front and have chosen names for your children that have amazing spiritual significance. I think that's wonderful! Thanks for this inspiring post, my friend! Yes, my name and identity are grounded in Christ! What more could I need?